Mac OS X Lion Server provides two choices of software that you can use to start and manage network printer sharing. The simpler and easier of the two is System Preferences, and it may be all that you need. System Preferences is the first place you’ll go to turn on print sharing. The more powerful is the web interface to the Common Unix Printing System (CUPS). 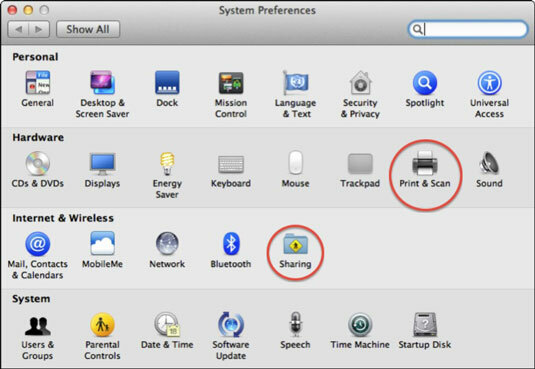 You can use either shared printers connected to the Mac, or you can share network printers. For the latter, it means hosting the print queue on the server instead of the printer. Although it is limited in abilities, you can use System Preferences to restrict usage of print sharing to certain users or groups who are in the network directory. You can also use Workgroup Manager to further limit which users and groups can access specific printers. To set up printer sharing, you access two areas: the Sharing pane and the Print & Scan pane. 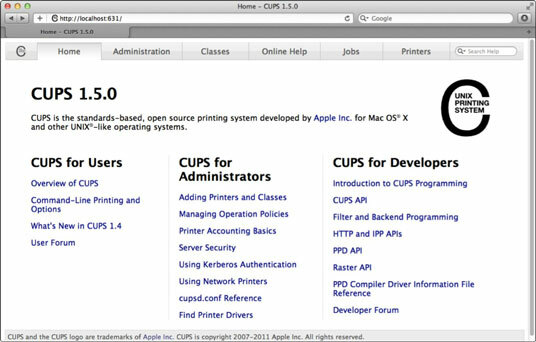 CUPS is actually the print engine in Mac OS X and has been since 2002. Apple adopted CUPS soon after it was created as a print system for Linux in the late 1990s. Apple became a major developer and, in 2007, purchased the CUPS code and hired the creator, Michael Sweet. Apple continues to offer the CUPS code under open source licensing, so it continues to be part of many Linux distributions. Use these URLs if you’re logged into the server Mac that is hosting the printing. If you’re accessing your server from another computer, use instead a URL in this form: http://server-ip-address:631, where server-ip-address is the IP address of the server on which you have printer sharing enabled. If you want to access CUPS from another computer (running any OS), you need to have Remote Administration enabled. Open the CUPS web portal (the first page), click the Administration tab, and select the Allow Remote Administration check box. The web interface of CUPS allows you to add printers and do some things that you can’t in System Preferences, including creating printer pooling (a type of load sharing) and print queues for network printers. The Online Help tab takes you to help and information pages. However, much of the help information is about the command-line interface.